Once your baby is born, the midwife/doctor clamps and cuts the umbilical cord. Where the cord joins your baby's tummy, there should be a 2cm or a 3cm stump. The cord eventually turns yellowish green, and then brown to black, and then dries out, and falls off usually within two weeks after birth. Here are a few tips on how to keep it clean and infection free. • Always wash your hands before and after you handle your baby for nappy changes or for cord care. 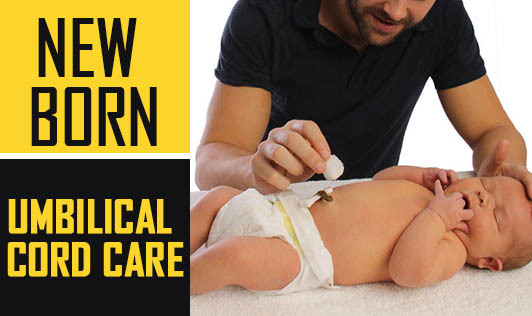 • Keep your baby's umbilical cord clean. Doctors would suggest dabbing the stump with alcohol but nowadays they suggest leaving it alone. Wash it with plain water and a mild or an unperfumed soap with neutral pH. • Keep the cord dry. After a bath, pat dry with a soft towel or a cloth. Make sure your baby is kept warm till the stump is dry and then put on a nappy. Expose it to air often so that the base dries out soon. Fold down the diaper so that it does not cover the stump. When the weather is warm, you can dress your baby in a diaper and a t-shirt so that there is more aeration. • Sponge baths are more practical for healing processes. A tub or a sink bath can increase the chances of infection. • Allow the stump to fall off itself. Resist your temptation to pull it off by yourself even if it is completely dry. While the stump is healing, it is normal to see a little crust or dried blood around it. But if your baby's cord appears to be red and swollen around the base or continues to bleed or ooze pus and produce foul smelling discharge, reach out to your pediatrician immediately. An apt treatment started early can prevent spread of infection.